Nintendo – "On Game Design"
This gets really good at about 1:08. This technology is really exciting to me, but I really want it in glasses form. This is starting to make me very sad that the 3DS 3D effect makes me ill. This is the first Spyborgs-related story I’ve seen in a while. I guess Nintendo power has a little tidbit on it’s hands. I can’t say for sure either way, but at least it’s a mention of the project I’m working on. 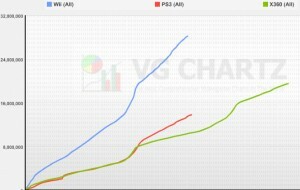 I found this site called VG Chartz. It’s a nifty little site that lets you track (very approximate) meta-data about games and gaming hardware. 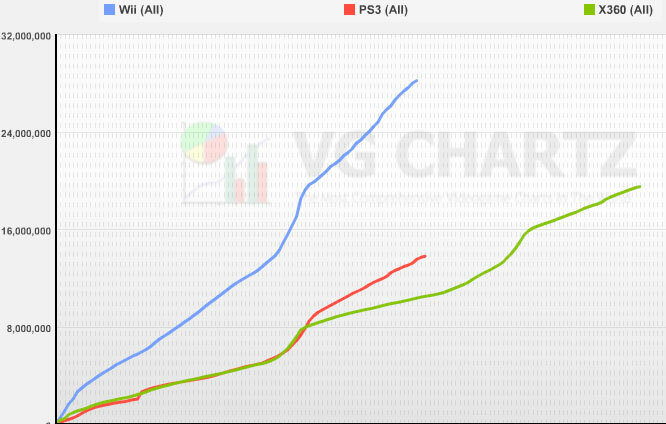 They have a neat little feature that lets you chart any three consoles while normalizing their start dates. I was just remembering yesterday how over the holidays I took my Wii home for my relatives to play. It really amazed me how easily they all, from my 5 year old cousin to my 60 year old aunt, picked it up. Most of the time, when I brought my game systems with me, I’d get a lot of “Hey, can you turn that off.” Or when I’d ask if anyone wanted to play, I’d get “No thanks, it looks too complicated for me.” The only exception to this, before the Wii, was Guitar Hero.